Sony is on a tear with new cameras, and the curious thing about the RX series is that they all take a very different attack on the compact camera market. The RX1 is a prime lens, large sensor compact (full frame). The RX100 is a shirt pocket convenience camera with a modestly large sensor (1"). So what is the RX10? An attempt at being the "all-in-one" camera, I think. That "different" is mostly defined by the Zeiss 8.8-73.3mm (24-200mm equivalent) f/2.8 lens out front. From front to back with the lens collapsed and supplied lens hood on the RX10 is a hefty 6" (155mm) deep. This camera is all about the lens, and much of the camera design all revolves around the implications of that lens. In essence, Sony has put a small DSLR, 24-70mm f/2.8 lens, and 70-200mm f/2.8 lens in a single package. To keep that package as small as possible—and note that it's considerably smaller than any DSLR with those two lenses would be—Sony stuck in their highly competent and decent performing 1" 20mp sensor. Using an APS sized sensor would have bulked up the lens (or dropped the parameters to a shorter focal length and smaller aperture or both). Thus, those expecting the RX100 to be 1", RX10 to be APS, and RX1 to be full frame in a nice orderly fashion will be frustrated. Many people won't remember it, but the RX10 is actually a fairly direct descendent of the R1 (2005), which had a largish sensor and a 24-120mm equivalent Zeiss f/2.8-4.8 lens out front. So the notion that the RX10 is something entirely new is false; instead it's a new interpretation of Sony's long-running all-in-one prosumer series. The good news is that Sony has left little out of this iteration and pushed it further than ever before. Besides the 1.4m dot EVF you frame with, there's a 3" 1.3m dot tiltable LCD out back. While neither is state-of-the-art, both are solid performers for this class of camera. The more important thing is refresh rate, which is decently high for an EVF. The lens is the primary player here, so let's look at some parameters for a moment. Across the long axis of the frame we're talking about 10 to 74° of coverage. That's reasonable telephoto to fairly wide angle. The zoom is controlled by either the fly-by-wire ring on the lens or by a W-T lever mounted in front of the shutter release compact camera style. The lens itself takes 62mm filters and comes with a supplied petal type hood that can be reversed on the lens for travel. One surprise for many will be the aperture ring on the lens, with click stops every third of a stop (which can be disabled to allow continuous aperture control for video). Another surprise for some that shouldn't be is that the lens extends quite far in front of the camera when you're at the 200mm equivalent position. It doesn't quite stop there. With an f/2.8 aperture and a smaller (but still not compact) sensor, you might want to utilize that f/2.8 to get as much depth of field separation as possible. Fortunately, Sony thought of that: there's a built-in 3EV neutral density filter option that can help you force larger apertures in brighter light. Someone thinking photographically was involved in the design of this camera, and it shows in the details. Focus can be as close as a little over 1" (30mm) at the wide end, to about 12" (300mm) at the long end. This gives macro magnification of from close to 1:2 (wide) to 1:3 (telephoto). The 20mp 1" sensor is bigger than the 1/2.3" or 2/3" sensors used by most rivals in the upper range of compacts. This is basically the same BSI sensor used in the RX100II, and quite a capable performer. As I've written elsewhere, try not so much to think of it as a 20mp sensor, but a 12-14mp sensor and you'll be astounded by what it can do. Trying to push it to the boundaries you might expect from the 20mp number, especially in low light, and you might be a little disappointed, though probably only a little. You can shoot raw files, and of course, there is video capability. As a matter of fact, the video capability is quite good, which I'll get to later. ISO values from 125 to 12,800 are supported, and Auto ISO is also available. The new BIONZ X processor is on board, along with Sony's claim of better handling of JPEGs when the sensor is pushed to extremes. Shutter speeds range from 30 seconds to 1/3200. There's a pop-up flash, Mode dial with two user setting positions, multiple configurable buttons (Fn, C, AEL), an exposure compensation dial nicely positioned, a top LCD for basic settings review, and a hot shoe up top. The hot shoe and tripod mount are centered on the lens. SD cards go into a slot on the side of the camera, ala a DSLR, and the side doors on the left of the camera (as you're holding it) are hinged. In virtually all design aspects, including the menu system, you're likely to be reminded more of DSLR than anything else. Up top is a tiny pop-up flash, and we have the usual slow sync and rear sync options, as well as flash exposure compensation. When I say "DSLR-like" in terms of the menus, you'll find things like changing aspect ratios (1:1, 4:3, 3:2, 16:9), setting fill flash and flash exposure compensation, bracketing, configurable self timer, auto HDR, and more. You can configure a whole host of controls, as well as set up those custom settings on the Mode dial. You can make the Movie button only respond when you've set the camera to record video (on Mode dial) or have it as an instant movie option. There's manual focus assist, too. A good solid set of options overall, though that also means that there are 21 pages of menus you have to navigate. Video is well specified, and we have microphone and headphone ports to help (the camera has stereo mics flanking the hot shoe). The video formats are AVCHD at 1080P/60/30/24 and 1080i/60, as well as a 480P/30 mode for VGA type video. More interestingly, the HDMI port supports uncompressed video output, so you can record using external recorders to better quality video should you desire (e.g. Atomos Ninja). Some consumer-like features are also in the camera, as well, such as a sweep panorama mode, Scene modes (including Sony's useful Hand-held Twilight mode), and the requisite all-Auto mode. The camera takes the same NX50 batteries as do most of the NEX and some of the Alpha models (a reasonable 420 shots CIPA), but does not come with a separate battery charger (instead it comes with a in-camera-via-USB charging system). But wait, there's more. The RX10 has WiFi with NFC to quickly connect with smartphones or other devices, has Sony's PlayMemories App support, and can be controlled remotely via the WiFi connection (typically via smartphone), as well. I've used the term all-in-one more than once, and it really does seem to apply to the RX10. About the only thing left out is GPS. From just a pure features list, there's really very little I can think of that I do regularly in photography that this camera isn't set up to do on its own. Unfortunately, it has an all-in-one price, too, with retail being US$1299. The camera is made in China. Lots of good news, lots of not-so-good news. This is going to be a tricky section to get right, as there's so much going on with this camera that there's bound to be some things that have some compromise to them. At the same time, however, the way most people will use the camera may have those things mostly disappear. Right up front you have to think of this camera like a small DSLR. That's how it handles, basically. You've got a lot of control at your fingertips, and a lot of configurability. The really nice part is that basic tasks are well at hand. Apertures controlled by the ring on the lens. Shutter speed controlled by the rear command dial. Exposure compensation controlled by a dedicated dial behind the shutter release. Shooting mode controlled by the Mode dial. ISO is by default assigned to the C button just behind the shutter release. And the Fn button brings up the quick menu of the most likely other things you'd like to set. So far, so good. Some might want to assign white balance to a control directly (instead of via the quick menu brought up by Fn), but that's most of your shooting decisions right at your fingertips out of the box. Where things start to fall down is zooming, and to a lessor degree, focusing. We're in a fly-by-wire camera, so there's no direct coupling of the ring on the lens to either zoom or focus elements. If you zoom slowly via the lens ring, the lens is going to work pretty much as you expect. When you move the ring quickly, things break down, as there's lag to the movement and the actual movement you get is tough to anticipate. There can also be some slight stutters to the zoom (more visible when zooming out via the lever around the shutter release). I've seen far worse implementations and can live with this one, but forget leaping from 24mm to 200mm. I can't quite do that with my usual hand position and thus end up taking a few laggy jumps to get from one extreme to the other. Not a huge sin, but just be aware that zooming is not going to be an instantaneous or precise thing with this camera when you make large movements. Focus method is controlled by a lever on the front of the camera, in the position typically used by DSLRs. The default is central focus area (normal sized, though you can choose wide). Where things start to break down here is in two ways: selecting the point of AF and manual focus. If you want other than the central focus area to be used, you need to select Flexible Spot. But this works more like a toggle than something that is continuous. 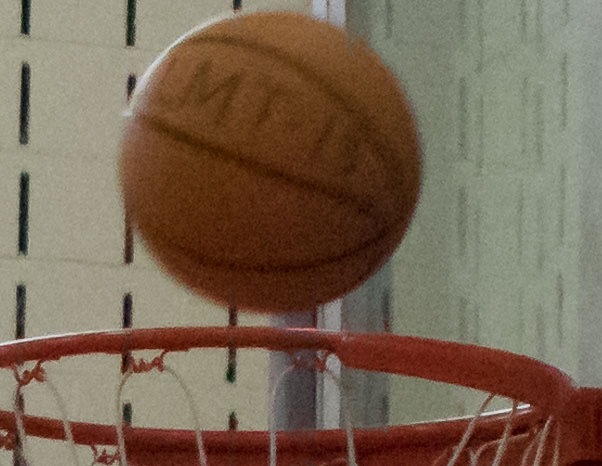 If you're constantly moving the focus area around, you have to retrigger the mode. Given that the DISP button is functional again after you've shot an image, it would have been nice to be able to hit that button and restore the moving focus position. Basically, this is a clear design error to me, and one of the few things that didn't get implemented properly by the Sony engineers. Manual focus is either DMF or MF. DMF doesn't supply magnification when moving the focus ring, MF does (default two seconds). There's surprisingly little lag with the ring for focusing, but again like zooming, large leaps may take multiple twirls if you don't want to completely distort your hand position. Focus peaking is available, as well. Button and control placement could be a bit better, I think. 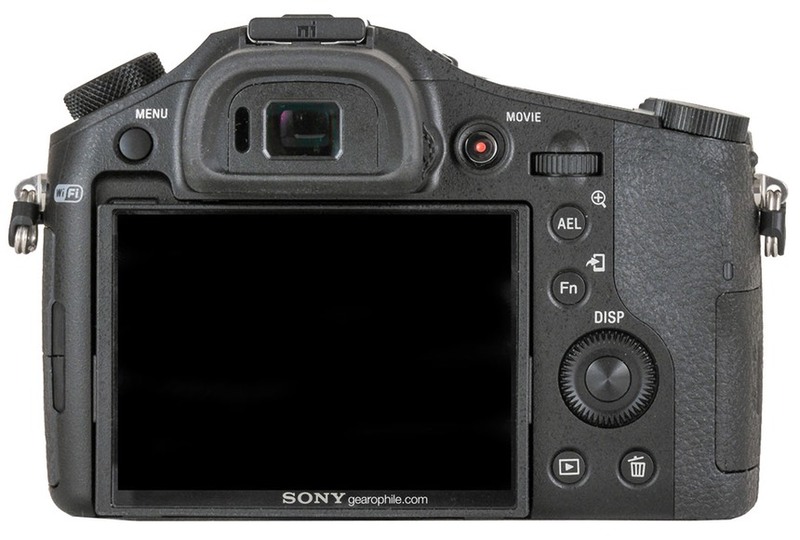 The MENU button at top left on the back of the camera seems out of place, especially when most other Sony cameras have either the center button of the Direction pad or a dedicated MENU button on the right side. Those with large hands are going to have some troubles with the position of the AEL and Fn buttons, I think, while those with smaller hands are going to find the Direction pad too far down the back of the camera to keep hand position while shooting and changing things. None of these are big problems, but they get magnified with gloves on, as in several cases the buttons are inset and already tough to find and use with gloves. The right hand grip isn't huge, but it's appropriately sized, I think, and gives you a strong grip position. Those with large hands might find it a bit confining, though. Sony finally listened to user and didn't put the Record Movie button right where the thumb naturally falls when shooting. The position is accessible but not likely to be accidentally pushed. Finally. Video users will especially be pleased with the little nuances that Sony added to this camera. 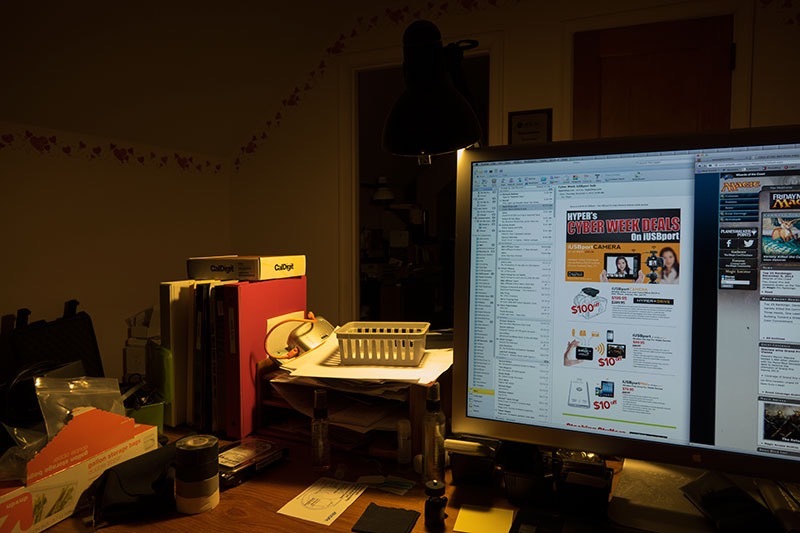 You can disable the click stops on the aperture ring, for instance, giving you smooth exposure control. Moveover, you have programmable Zebra bars to help guide your exposure and many ways to access that 3-stop neutral density filter. The RX10 makes a surprisingly handy video camera, actually. About the only thing that gets in the way is the noise of the zoom when you use it (focus can be silent). Battery life: The Sony-standard FW50 batteries (shared between many of their NEX and other cameras) are rated at about 420 shots CIPA, and I've found that I can achieve close to that as long as I avoid much flash work and keep the camera inactive between shooting. Video shooters are going to find the battery life a bit more limiting, I think. I had troubles getting more than 90 minutes of video on a charge. Write speed: Nothing particularly outstanding here, but nothing to get upset about, either. It's not a camera I want to be trying to shoot continuous raw with, but shooting single raw images over and over is not at all troublesome. If you want numbers, I was hitting 3 fps with JPEG Fine in 10 second bursts without wait, but only a bit over 2 seconds shooting raw with for some reason a slightly lower fps. In speed priority you lose continuous focus and get closer to 10 fps for very short periods (2 seconds, max). Buffer clearing, when full, is counted in seconds, but not excessively so. Overall, the performance with 95Mbps UHS-I cards is well above what you'd expect from a compact camera, not quite what you'd expect from a DSLR. Focus: Pleasantly surprising, especially if you allow the camera to "pre-focus" (start working focus with the camera active on a half shutter press). Single shot focus performance is right up there with the consumer DSLRs, which is a bit surprising when you zoom out to 200mm. Continuous autofocus is not nearly as good as DSLRs, and if you're in continuous focus mode and panning from subject to subject with focus active you'll see that there's actually a serious lag in the camera moving focus in this mode. I had a difficult time getting fast subjects in focus with continuous shooting. Lens: With such a large range and fast aperture, you expect there to be compromises. Let's start with the good news: at f/5.6 you're going to have a hard time finding sharpness issues anywhere in the frame at any focal length. I can see very slight softening in the extreme corners in a few cases, but nothing that would really bother me. So if you want really sharp, just stop down two stops, just like with most lenses. 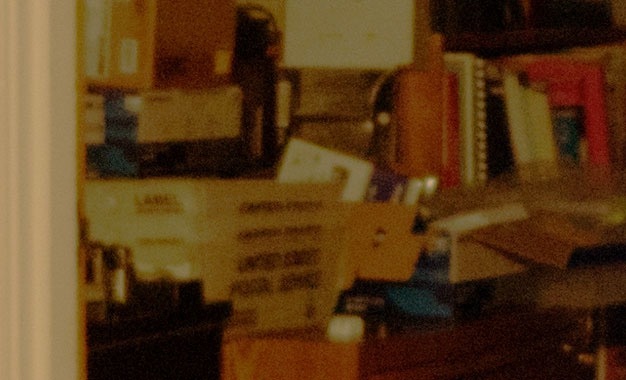 But at f/2.8, there's definitely visible softness in the corners and some visible chromatic aberration (mostly corrected in camera for JPEGs). Image center, however, is quite sharp at f/2.8, indeed, a bit sharper than I expected at the extreme focal lengths. Vignetting is well under control, almost to the point of being able to ignore it at f/2.8. Linear distortion is corrected by the camera quite well for JPEGs and essentially nil, but if you're using a raw converter without lens profiles you're going to find quite visible barrel distortion (~2%) at 24mm and a similar amount of pincushion distortion at 200mm. Both those need correcting if straight lines are important. Flare is well under control, a bit surprising for a 24mm f/2.8 equivalent, and the supplied lens hood does a good job in keeping glare down from side light, too. Given the fast aperture and the long focal range, the Zeiss lens on the RX10 is performing quite well. JPEG shooters are going to see a lot of the weaknesses of the lens simply rendered non-existent by the in-camera corrections that can be applied. About the only thing they'll notice is that the corners get sharper and brighten a tiny bit when they stop down from f/2.8 to f/5.6. Raw shooters will need to do some extra work to pull out the distortion and chromatic aberration. Overall, I'm very happy with the lens considering how much it is trying to do. Resolution: 20mp seems like a lot in a tiny camera. It is. Be careful not to think of it as 20mp. Between diffraction and other attributes, I'd say that the RX10 shoots like a really great 12-14mp camera. If you try to push it as a 20mp camera and maybe even take that a bit further and try to get bigger than 18" prints with this camera, I think you'll be slightly disappointed. But certainly for smaller work you can do some impressive things with this camera. Dynamic Range: I mostly shoot with my RX10 at base ISO or close to it. It isn't a huge sensor, after all. While DxO lists the Sony's dynamic range as higher than that of the Nikon 1 models with their 1" sensor, I'm not so sure I'd fully agree in practical use. Certainly with JPEGs it seems as if Sony is restricting the range a bit to provide extra contrast in the result, but even with raw files I'm not seeing the full difference implied by DxO's numbers. I will say that the RX10 is clearly better than the Fujifilm X20, and even the Nikon 1 models, but not by as much as some people are claiming. Okay, so there's some noise in there, but this area was black in the original! One of the things about the recent Sony EXMOR sensors is that they do allow for quite a bit of shadow recovery. Here on the RX10 the extreme recovery I've just made is a little noisy and the colors are blocked up, but for such a small sensor, this is still darned good performance. Video: Because the RX-10 doesn't line skip to produce video, a lot of folk had high hopes for this camera. Let's hope that they have external video recorders (e.g. Atomos Ninja), because the camera's internal compression is definitely bandwidth limited and like most AVCHD implementations, just doesn't deal with complex and detailed motion all that well. You get that "muddy" frame look that's a dead giveaway for bandwidth-limited AVCHD. The good news is that everything else seems to be fine. The sub-sampled full frame does indeed seem to produce less moire and artifacts than most DSLR-type high pixel count video implementations. But you're really only going to see that improvement on motion by recording the clean HDMI externally. Also, while the RX10 has user controllable microphone settings (internal or external mic), the amplifier used isn't as clean as good external ones, and it's awkward to manually control the sound levels anyway. It's the age old problem: size, performance, price; pick two. Sony tried their darndest to pick three, and that has introduced some gives and takes that don't necessarily all add up perfectly. Basically, performance was mostly optimized (though not for internally recorded video)—there's little to complain about there, especially the lens—but size didn't get fully minimized because of that and price stayed high. Nothing quite adds up right in terms of our normal expectations. It's a compact camera, but it's not compact. It's got a high performance lens but not quite as high performance on focusing. It's got a DSLR-like feature set with even some higher-end extras thrown in, but it also ends up being priced higher than a lot of DSLRs. Sony's fundamental problem with the RX10 is that it doesn't fit neatly in anyone's expectations. Moreover, it's a "tweener" in almost aspect. Consider any specific photographic task. I've got a short trip coming up where I'm mostly in tourist mode, so maybe I'd like to just take one "convenient" camera with me to do some travel photography. Since I'll be on foot and moving a lot in a crowded city, I'd be tempted towards a really good compact camera. On the other hand, I want to be ready for virtually anything from macro to wide angle to telephoto to indoor to outdoor to…well, you get the idea. That starts to speak to using one of my DSLR-like mirrorless cameras. A DSLR is probably out because of size and weight by the time I make it fully capable of all I might want it to do (e.g. one body, multiple lenses). So the operative question is: would the RX10 suffice? I'm thinking the answer is yes far more often than no. That's true for the soccer mom running around trying to document her kids, the dad photographing the family vacation, the college student looking for a single solution that keeps them into serious photography and video without clogging up their dorm room with gear, and a whole host of other common scenarios. It all comes back to the lens and sensor. We know the sensor performs well (see my RX100 review). The Zeiss lens on the RX10 is a real jack-of-all-trades, replacing several hefty lenses you'd need on a DSLR to do the same things, and doing so with very good quality, just as you'd expect from Zeiss. This is a very nice pairing, and capable of many things photographically. It's not a perfect pair, as you can force the sensor to struggle in low light and the focus performance of the lens isn't DSLR like for moving subjects. But, still, I was surprised at how much I could coax out of the sensor/lens pair. I have to say I'd probably prefer the RX10 combo to a lot of low-end DSLR plus kit lens combos for a large chunk of photographic situations. Which brings us to price. The RX10 is way beyond consumer DSLR price range. Of course, if you could buy a low-end DSLR with a 24-200mm (equivalent) f/2.8 lens, it would be more money than an RX10. Try it. 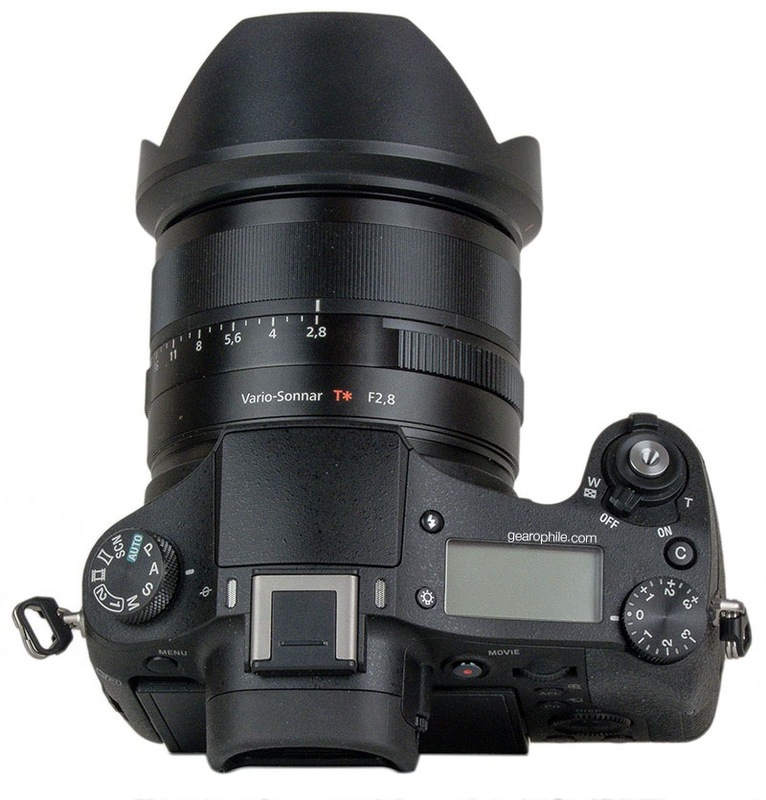 Take a D5300 body (US$800), and Sigma 17-50 (US$570) and 50-150mm f/2.8 (US$950) lenses. You've just spent US$2320 (though you've gained a larger sensor that will work better in low light by about two stops plus some additional reach at the telephoto end in the process). So I think how you evaluate the RX10's price really comes down to how well you evaluate what you're getting. I happen to think you're getting a lot. No, it's not perfect, and there are tasks it will struggle with, but it's clearly over the 80/20 rule line. More than 80% of the photography I do casually could probably be taken with this camera. It's a little bigger and heavier than I'd like, but my other go-to casual camera, the Sony RX100II, doesn't quite hit that 80% mark (it misses on wide angle reach, telephoto reach, some low light work, and on video capability, but it's usually the wide end where I find I want more). So it's a tough call. 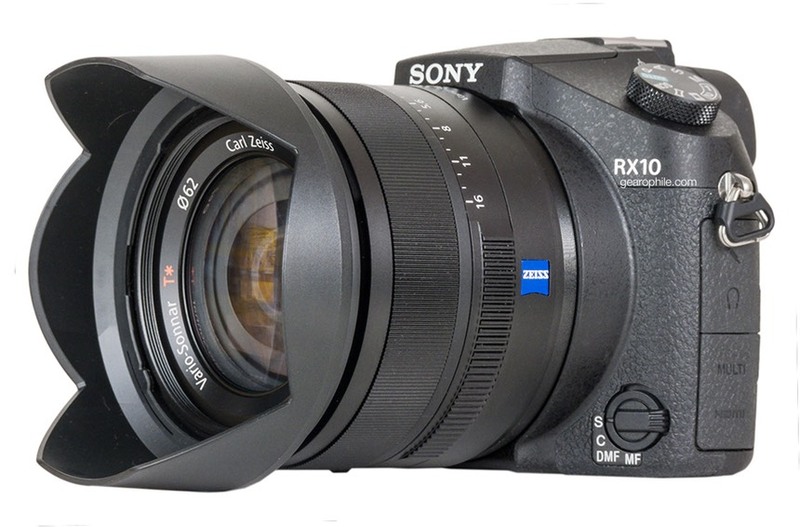 That said, I'm pretty sure there are many who will love the RX10 and see it for the all-in-one they were seeking. Others won't get it because they don't appreciate the lens or balk at the price. Still others will be trying, like Sony, to figure out that size, performance, price equation and see if it adds up. I wasn't expecting to like the RX10. On paper you can't make that equation work out quite right. In practice, I'm okay with the size and performance balance, so I'd say that it really comes down to whether you think that balance is worth US$1300. Yes, I know it's a lot to spend on what some will think of as a compact camera. But I have to say, it's a far better value than Nikon's Coolpix A when all is said and done ;~). There really isn't anything else quite like the RX10 on the market at the moment (the even-more-expensive Leica X Vario comes to mind with its larger sensor and lesser lens). You can find cameras that picked less in terms of the size, performance, and price factors, and you can find cameras that picked more for those things (especially in separate components, as the mirrorless and DSLR do). Whether the RX10 is the Goldilocks solution for you is something you'll have to figure out. For me, surprisingly the RX10 is sticking around in my gear closet for the time being. There are a lot of times when I'm out doing more casual shooting where I just want to carry one thing that can do a lot. I don't know of a better solution for that at the moment. But Sony: please, please look at making focus point selection better and improve the continuous focus performance. It's the one significant thing that keeps popping up as a factor in my shooting. Sure, I can focus and reframe and due to the small sensor not get badly burnt by that, but I'm a DSLR shooter and I want control and continuous shooting ability. Why Sony got everything else like a DSLR and botched focus point selection and continuous focus performance, I don't know.